On Friday of this week, the history department will celebrate the many books recently published by members of our department, and their authors. Members of the UVM community and the general public are cordially invited to join us at 4 PM on January 29 at Billings Library Apse for free food and brief remarks by several of the authors. As part of our celebration, this week on our blog we will be featuring short commentaries by the authors on their books, and the research and writing that went into producing them. In this second installment, we hear from Professors Susanna Schrafstetter and Alan Steinweis. Professor Schrafstetter specializes in modern and recent European history. Professor Steinweis is a professor in the history department, as well as the Miller Distinguished Professor of Holocaust Studies. He specializes in Modern Europe, Nazi Germany, the Holocaust and Jewish history. Schrafstetter and Alan Steinweis, eds., The Germans and the Holocaust: Popular Responses to the Persecution and Murder of the Jews (Berghahn, Nov. 2015). 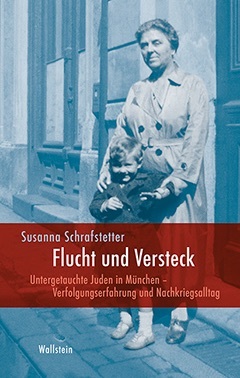 “My book, Flucht und Versteck, focuses on Jews in and around Munich who tried to flee deportation from Germany and survive in hiding. While most flight attempts and rescue efforts occurred in Berlin, where the great majority of German Jews lived, Jews in other parts of Germany also attempted to go underground. The book examines the extent to which conditions for living underground and strategies for survival differed among Munich, Berlin and other areas of Germany. It reconstructs the chronology of the multiple waves of flight, and examines the many different routes followed by fugitive Jews. It also traces the post-war experiences, both in Germany and elsewhere, of Jews who successfully survived in hiding. These included struggles with health problems stemming from their lives in the underground to the struggle for public recognition and financial compensation. I had not originally planned to write a book on Jews in hiding in Munich. My plan had been to publish one case study of Jews refusing to let themselves deported as an example of Jewish resistance. However, when I started to look for cases, I found more and more stories, and I kept digging for more information. In this way an academic article grew into a small book and eventually, into a sizable book.